Porro prism system,hi-index BAK4 prism and FMC coated lenses provide bright and sharp viewing. 7X magnification,50-Millimeter lens diameter,and auto focusing Porro prism,22-Millimeter eye relief and 6.8-Millimeter exit pupil,396-Feet field of view at 1000 yards. 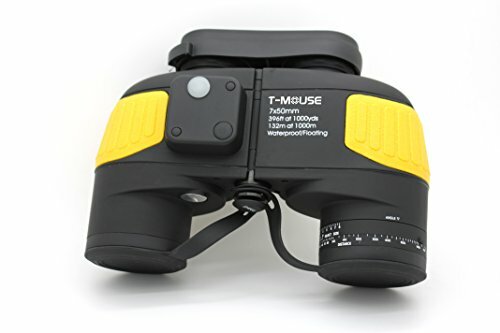 The binocular is waterproof,dust-proof and float,suitable for outdoor use,such as watersports and mountaineering etc. Nitrogen gas inside the binocular eliminates fogging and mold on internal lens surfaces even under extremely severe condition,such as rainstorms and high humidity.even if the binocular falling into the water,it will float .So as to prolong the service life of the binocular. The built-in mechanical compass is easy to read. Rubber armor body provides great shock resistance and a comfortable touch,firm grasp.Tripod adapter design provide more choice when use it. If you have any questions about this product by Tmouse, contact us by completing and submitting the form below. If you are looking for a specif part number, please include it with your message.